This has raspberry as the other wines do, but it is vivid like eating fruit off the vine. Cola, bacon fat, black pepper, boysenberry, blueberry. The tannins are soft and play perfectly against the acid, which is ample in this bottling. The finish shows plums and darker fruits and becomes smokey and smells/tastes of portobello mushrooms. Visiting Lucy and Tom is always a refreshing experience. They take utmost care of their vineyard, deliberating course of action with equal parts education and experience, and they have been tending the same vines for over thirty years. The evidence of their work and care is clear – not only in the appearance of the vineyard but the quality of fruit they produce and subsequently the wines. 2013 is no exception, the wine is substantial with all the trappings of past vintages, dark fruit, firm but elegant tannins and fullness yet weightless, all at 11.5%. A little about the label: We enjoy watching chickens here at the farm, we call it chicken TV. Clare has attempted to capture one moment of that here. Bright transparent cherry red color. Barrel toast, vanilla, cigar box, pot pourri, tree bark. Some strawberries and raspberries showing, with black tea and cedar plank on the palate. Also a pleasant humus wet earth note. This wine is very reminiscent of the 2007 vintage wines that showed a light touch when young yet managed to gain considerable weight after a few years in bottle. This site offers persistent fruit sweetness, complete and fresh through out the entire wine. The long finish is carried by that same fruit. This wine is drinking beautifully now but will also cellar. This is the first year we have worked with the fruit from this vineyard and I hope to continue for many years into the future. First off, owners Lucy and Tom couldn't be any sweeter or dedicated to growing the best fruit possible. 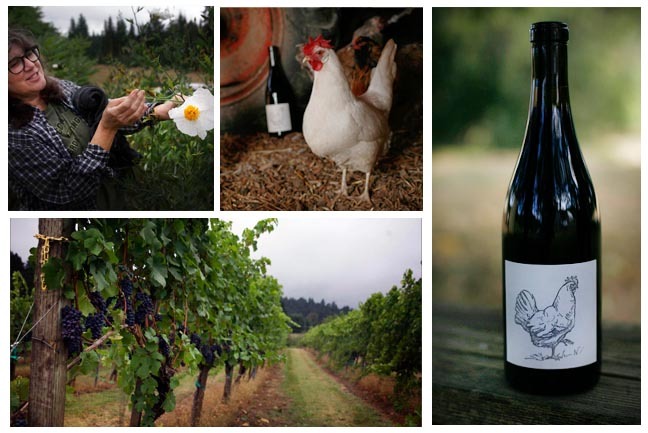 Second, their vineyard has produced a wine that is complex, layered with all kinds of flavors, and saturated with fruit, without being overpowering in any way. I believe that wine should be an accompaniment to food and think that this wine is a perfect partner for just about anything, save something too spicy - it has enough of its own. This wine is showing citrus again but also in a different form as Grand Marnier and highly unique to this wine. Mulled spices, green peppercorn, cranberry, strawberry, dried dill, cedar, rhubarb. Flavors are consistent with the aroma. There is a persistent fruit sweetness in this wine that never ends. It is complete and fresh through out the entire wine taste experience. The long finish in this wine is carried here by that sweetness that carries the flavor to the finish. This wine is drinking beautifully now but will also cellar.